I own a few exercise balls and enjoy using them with my children and grandchildren. This Professional Grade Anti Burst Tested Exercise Ball with Hand Pump by Live Infinitely is one of the larger ones I own, and the size that most of the adults prefer. The smaller sizes are better for the younger ones, although they usually love it when they get the chance to use the bigger ones too. I bought the 75cm ball in grey. I would have chosen the purple but they were out of stock at the time I ordered. The ball is a good size, so it took a few minutes to air it up, but my son inflated it for me without any trouble. Once inflated, we took turns using the stability ball for various exercises. I find that this size is also a very good size for sitting at my desk. 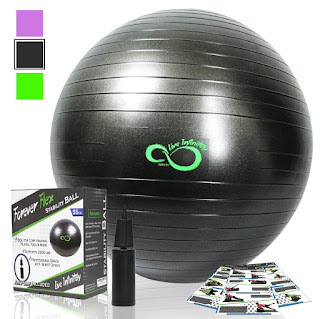 Although this or any similar item can be punctured, these anti-burst fitness balls are said to support up to 2200 pounds of static weight. Bouncing would lessen the weight limit to some degree, but I don't think this would be a problem even with the crew at my house. Along with the ball and pump, you also get access to a workout guide. These are professional grade balance balls that easily compare to those used in my physical therapy sessions, and I would happily recommend them to all.